This full day tour departs daily at 9 am from Lisbon throughout the year. Collection time is between 8.30 and 9 am. Visit outside of the busy summer season to avoid crowds. We are comparing Sintra, Cascais, and Estoril: Full-Day Tour from Lisbon Prices from leading ticket suppliers and Try to find you Cheap tickets prices on the market. This full-day excursion from Lisbon packs a lot of sightseeing into one day. This trip will take you to a variety of interesting and mesmerising places including the Pena Palace, one of the 7 Wonders of Portugal, and all the way to the westernmost point of Europe. This day trip will begin around 9 am with pick-up from your Lisbon hotel. Once onboard your coach, you'll be introduced to your bilingual guide/driver and your sightseeing comrades, this is a small group tour so you'll have the chance to ask questions and talk to your guide throughout the day. Your first stop will be at the Pena Palace. Originally a medieval chapel, the site was converted into a palace for King Ferdinand II in 1838 and recognised by UNESCO as a World Heritage Site in 1995. After exploring this famous site you'll have free time to explore the seaside village of Sintra; visit another UNESCO site, Quinta da Regalia, stop by the National Palace, stroll the gardens, or grab a bite to eat in the village centre. Continuing your journey to Cascais you'll stop at ‘Hell's Mouth' and Cabo da Roca to take for panoramic views over the Atlantic ocean. The final two stops will be at the former fishing village and holiday home of the Portuguese Royal Family, Cascais, and at Estoril for a visit to the famous casino and gardens. At the end of this 8-hour tour, you will be dropped off at your hotel in Lisbon. This is a comprehensive sightseeing tour which offers visitors an opportunity to see both historic features and breath-taking scenery. If you would like to take a trip outside of the city, to see the Portuguese coastline, but still learn about the history of the area, then this tour is perfect. Your Experience With Sintra, Cascais, and Estoril: Full-Day Tour from Lisbon? Combine historic towns with beautiful vistas and a visit to one of the 7 Wonders of Portugal on a full day excursion from Lisbon. Enjoy free time in the picturesque towns of Sintra, Cascais, and Estoria, with a visit to Pena Palace and option to visit Sintra National Palace. Journey through stunning scenery to the westernmost point in Europe, Cabo da Roca. Travel with a knowledgeable bilingual guide. What Sintra, Cascais, and Estoril: Full-Day Tour from Lisbon Includes? Round trip transportation in air-conditioned coach. Lisbon to Sintra (and Pena Palace) – Sintra to Cascais via Cabo do Roca and Hell's Mouth – Cascais to Lisbon via Estoril). 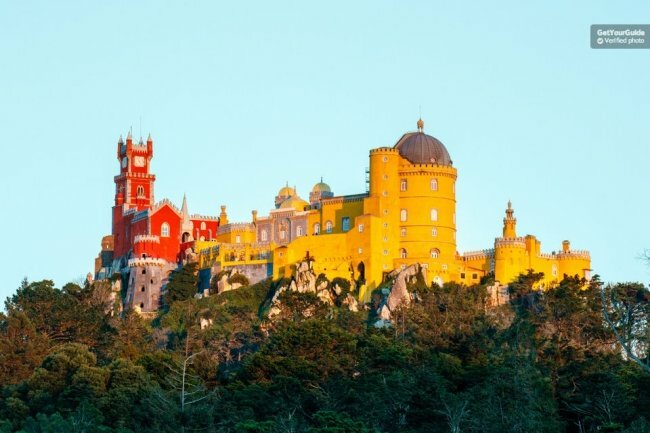 If you would prefer an extended visit to Pena Palace with unlimited time to explore then you may prefer a tour which exclusively visits this location to avoid feeling rushed. Travelers Reviews about Sintra, Cascais, and Estoril: Full-Day Tour from Lisbon? This full-day excursion from Lisbon has received very high reviews on trip advisor, mostly 4 of 5 stars, from participants. Most agree that the tour guides are excellent, friendly and informative and that the trip is good value for money. Minor criticisms are that time at Pena Palace is limited, but with so much to see in 8 hours, this may be a necessary compromise. Tickets purchased from Get Your Guide are fully refundable up to 24 hours in advance. Tickets purchased from Viator are fully refundable up to 7 days in advance. Tours are available in English, Portuguese, Spanish, Italian, or French. Tours may be conducted in more than one language. There is a minimum groups size of 2 participants and all children must be accompanied by an adult. Tour itineraries may vary between tour providers. Collection from Hotels in Lisbon (Estoril, or Cascais if specified). Please organise collection with your tour provider.